Coloured etching with aquatint of the Old Court House and Writers Buildings in Calcutta by Thomas Daniell (1749-1840) no. 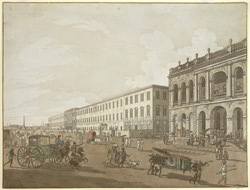 2 of his 'Views of Calcutta' published in 1786. This view is taken from the north side of Tank Square and looks towards the old Fort. The Old Court House is shown on the right. It has Ionic columns and an urn-topped balustrade. The Writer's Building is shown on the left. It was built as the headquarters of the East India Company by Thomas Lyon in 1777. In the distance, we can also see the monument erected by John Zephaniah Holwell to the memory of the survivors of the 'Black Hole' of 1756. The monument was removed from this site in 1821.